At the end of the 2016 tug of war season it seemed that our sport was fading fast but after some discussion with a few like-minded people decided to start a 5-a-side indoor league that developed into our 8-a-side competitions as the season progressed and developed. The association planned, prepared and pulled 400Kg 5-a-side competitions on points with a catch-weight as knock-out. Over the last 6 months our approach was not always conventional, adjusting accordingly as we went along however the sport as flourished with ladies and youth, all new recruits, pulling alongside our seasoned internationals. To our pleasant surprise, it was a rip-roaring success and the NITOWA Championships were the best supported for a number of years and possibility more importantly, ‘EVERYONE LOVED IT’. After Christmas the association planned weekly events and our 3 main indoor clubs headed to the British and Irish championships in Castlebar to represent Northern Ireland and their clubs, winning medals and respect from all involved. To top it off the Country Club travelled to Holland the following week and kept the success going, bringing home more silverware. The result is we are hosting the British and Irish Championships in Northern Ireland in Feb 2018 and hoping to have a squad travelling to China to compete in the Worlds in March 2018. It is the hope and intension what we want to put a similar plan into action for our outdoor season. Starting the season off with 6-a-side teams pulling at 500k with pullers within all cubs being classified as junior or senior and junior male pullers getting a 5 kilo weight advantage and females a 10 kilo. The classification is at the discretion of the executive and may be changed at any time otherwise this classification will last a maximum of 2 years. The NITOWA are having a very positive response from clubs and some new teams have emerged and we are hoping to kick start dormant/ struggling clubs. We are also contacting young farmer clubs that pull 6-a-side, to join our association and with that in mind we start the season off on Saturday April 8th at Ballygawley playing fields for 2 week-ends, then to Aghadowey on Sat 22nd April. Hosting pulls on Friday nights. Leo`s Boys Annual Pull at Benburb. The European Championships in Blackpool, England. 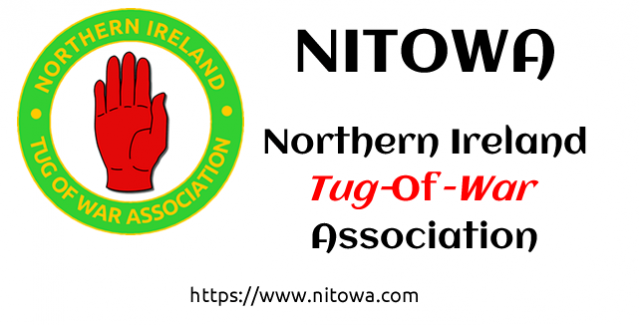 A strong association needs clubs that the NITOWA must protect and guide in the right direction and it is clear that we need change to succeed but we also need the support and help of the more senior individual members and clubs in our sport to help guide and build our base. Our first challenge is that we need new pullers, male, female and youth to revive, promote and develop this great sport of tug of war. There is no guarantee this will succeed but we will try. If you want to organise a competition contact a NITOWA Exec member and we will do our best to fit it in. Check the website for updated fixture lists and for all Club details. More in "News from the Chair"